2011-03-11  To work together for a better future! 2011-03-10  Takamura Guangzhou Co.,Ltd. 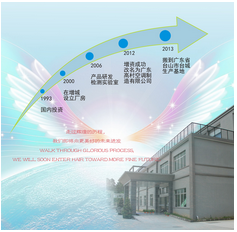 TAKAMURA GUANGDONG CO. LTD. was established with HongKong investment in China by Rising Advance (Hong Kong) Co. Ltd in 1993. In 2000 company occupied 30,000 square meter manufacturing area in ZengCheng City. Employees include senior professional air-conditioning engineers for design and development are over 30 persons. TAKAMURA GUANGZHOU CO. LTD. through the state approval, renamed to TAKAMURA GUANGDONG CO. LTD. In the same year, the company owned a land area of 50000 square meters factory in Taicheng, Taishan City, Guangdong Province, and relocation to Taishan city in mid 2013. To research, develop, manufacture, assemble and supply "TAKAMURA" brand air-conditioning units for central air-conditioning system are the typical productions of "TAKAMURA" company. The products are such as Fan Coil Unit, Air Handling Fan Coil Unit, Air-Cooled/Water-Cooled Chiller, Heat Recovery Water Chiller, Temperature Control/Humidity Control Unit, Packaged Air Handling Unit, Modular Air-Cooled Heat Pump Unit, Modular Heat Pump Heat Recovery Unit. One of the "TAKAMURA" Heat Recovery Air-Conditioning Units has been improved in structure and awarded the exclusive right of Chinese national new practical type product with the issue of exclusive right number of Zl200620062075. The company had awarded ISO 9001 international quality management system certificated. the company has awarded the production permit for industrial products in the whole country of China by the relevant Chinese Authority. The selling record of the company shows that the total selling amount of the company is being increased with an annual increment of 20% to 30%, the export selling amount is of 40% of the total selling amount of the company. In order to ensure and keep the best quality of the products, the company has invested and developed the new extension of its own research / testing laboratory. In existence of its current advanced machines and equipments in production, Complete production lines and hi-tech testing laboratories together with best after sales service. The people of "TAKAMURA" company with a strong sense of responsibility and new and high technology to create corporate brand, always adhere to the "quality first, customer first" as the main goal of the production and service concept, involved in the fierce competition in the market, first-class product quality, preferential price, satisfactory service, win support and trust of the user community. TAKAMURA company has upgraded to be one of the best enterprises in production of central air conditioning equipment accordingly in China. Any visit as well as precious advices being paid and given by any person or foreigner to TAKAMURA GUANGDONG CO. LTD. are extremely welcome and appreciated by the people of "TAKAMURA" company.